The circuit is too simple to be true and, (in fact – it is too simple)! You connect the positive wire of the energy source to the positive wire of the storage device, (and likewise the negative wires.) But “positive” does not mean the same Voltage in this case, the positive of the source should be higher than the positive Voltage of the battery. And that means even this simple circuit is not simple…the + of the lower Voltage will act as a minus and its minus as plus! Otherwise no current would flow. 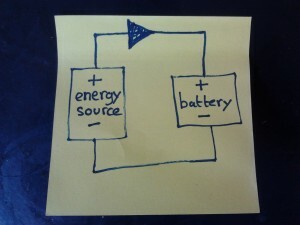 Again the goal is that the energy flows into the battery. But this current is not aware of what is the battery or the source, it just flows from “high” Voltage to “low” Voltage, within the circuit, where there is also a minus and a more minus. If your battery is “big” and your source is giving only tiny amounts of energy nothing seems to happen. Solution: you have to choose a good pair: eg piezo and small capacitor, or big solar panel and a lipo. 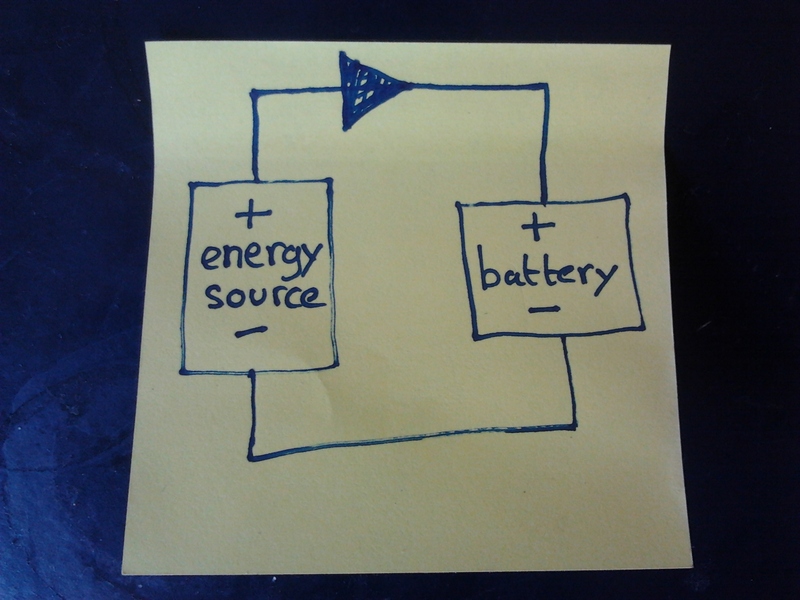 If your source is not always producing the energy of the battery might start running back through your energy source and the result is decharging the battery. E.g. solar cells only produce energy with light(or the Sun) and not at night. Solution: use a diode to block this wrong direction of the current. If your battery is charged…you should stop charging. Say the battery has a limit of 1.2V and you continue charging. Your battery is destroyed. This happens with the Chinese gadget – garden lamp. I have experienced a few times that after too much sun the battery is dead. Overcharging lipo’s can even be dangerous! Solution: either a voltage delimiter (LM317) or a more sophisticated harvesting IC, which has a voltage regulation.